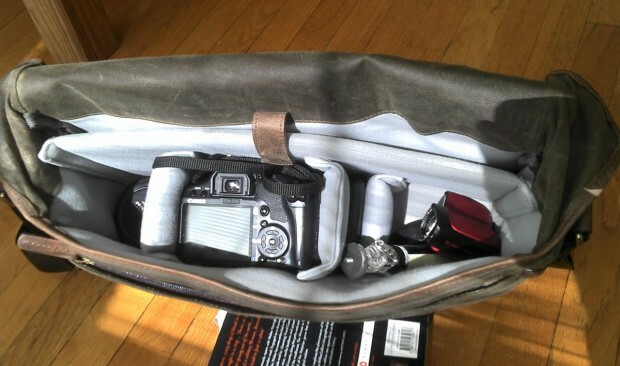 Short version: A good-looking and fairly durable alternative to your usual black-nylon camera bag. 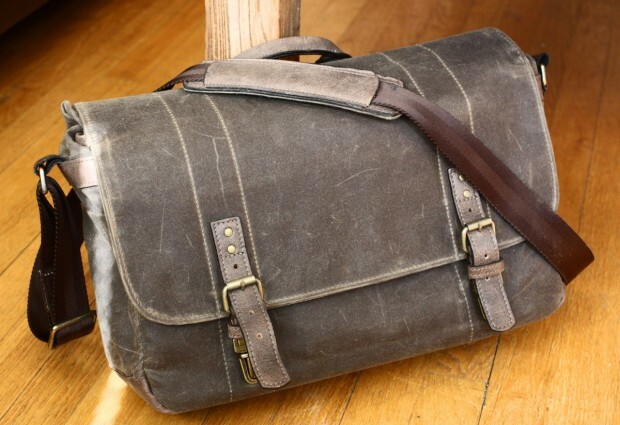 Not an all-purpose bag, though — definitely for the photographer who loves waxed canvas, not the gadget guy or world traveler, despite its Indiana Jones looks. I’m a big fan of waxed canvas. It’s old-school, it looks great, it wears well, and it’s reasonably resistant to the normal dangers of life: rain, dirt, light physical abuse. I’d drape myself in canvas if it were socially acceptable. So I was pumped to check out this bag from ONA. It’s their only “bag-size” bag, and it’s made more for photographers than tomb raiders, but it wouldn’t look out of place in an Indiana Jones movie. The grey and black colors, not so much, but hey. First, let’s establish the size, since it seemed smaller than I expected from their pictures and size is a very important factor when picking a bag at this price. The actual measurements are 16.5″ wide, 5″ deep, and 11″ high. Add an inch or so for strap, bulge, and so on. It’s not petite or extra-large, but it’s bigger than many camera-only bags and a bit more compact than many messenger bags. The material on the outside is the famous Waxwear cotton canvas infused with wax. 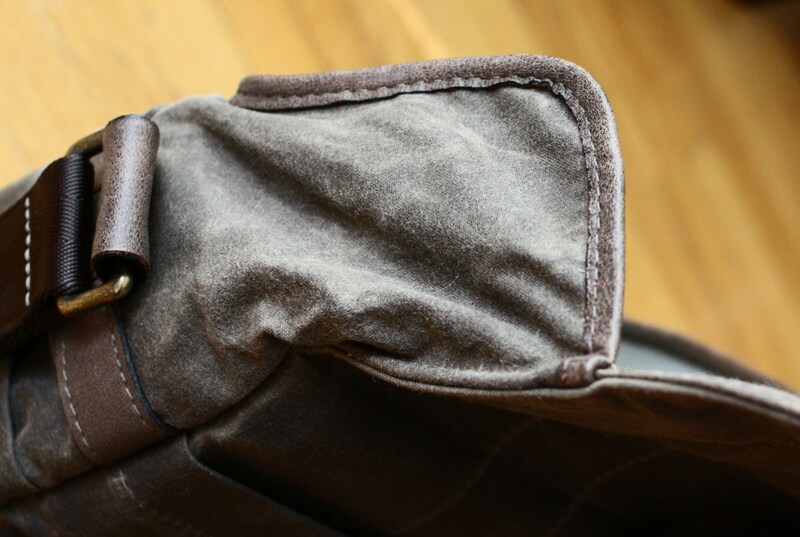 If you’re not familiar with waxed canvas, it’s got a nice organic feel to it like normal cloth, but it’s also stiff and resistant to day-to-day wear. I wouldn’t call it waterproof; it sheds water, as you can see here, but it will soak in eventually. Rain, snow, and mud won’t penetrate easily, though. 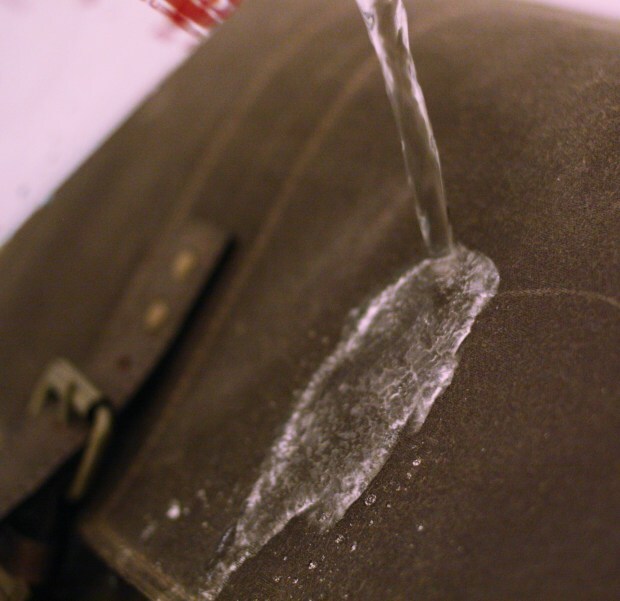 Scratches register easily but rub away, leaving a softer mark. The accumulation of scratches and wear is part of the charm of this material, and of course if that doesn’t appeal to you, this bag is definitely not your style. The clasps and buckles are of a nice warm brass, with attractive studs and visible stitching. I didn’t hear any creaking or clicking, and they seem to be put together pretty well. The fastening method is what they call “tuck-lock,” and it works well most of the time, but if you’re trying to keep the flap on tight, you’ll have to fiddle with them a bit. Fortunately adjusting the straps is a piece of cake. There is one external pocket on the back of the bag, flat and simple, for scrap paper or what have you. Under the flap is a zippered pocket with… not much room, but enough to put your phone, a pad of paper, some pens and such. The zipper itself is plastic, and feels a little out of place, but the inside is canvas with leather detailing and feels authentic. I like these little flaps (above) right at the edge of the main opening, which fold in and protect the insides from splashes, hands, or what have you. It’s a nice little detail and whoever noticed that there’d be a conspicuous gap there without them should be given a pat on the back. The main compartment is lined with a material whose color I can only call “seafoam.” Well, maybe it’s a little more greenish-beige than that, but I find it very incongruous with the rough-and-tumble Waxwear exterior. 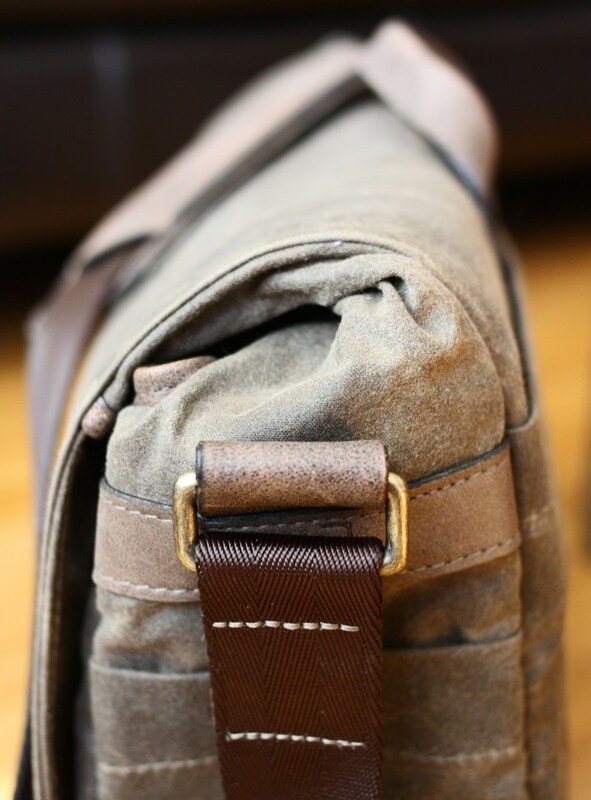 I asked about this, and the material was chosen because it’s velcro-compatible; more canvas on the interior would limit the configurations for your camera and gear, increase the cost, and wouldn’t be quite as soft and protective. Good points all, and all reasons why this bag should really be considered a camera bag first an a laptop/other bag second, if at all. There’s a medium amount of room in there — it doesn’t stretch or expand at all, and it doesn’t collapse very well. On the other hand, its semi-rigid shape makes it stand on its own quite easily and resist falling: great for setting down on the go and leaving it open for quick access to accessories. 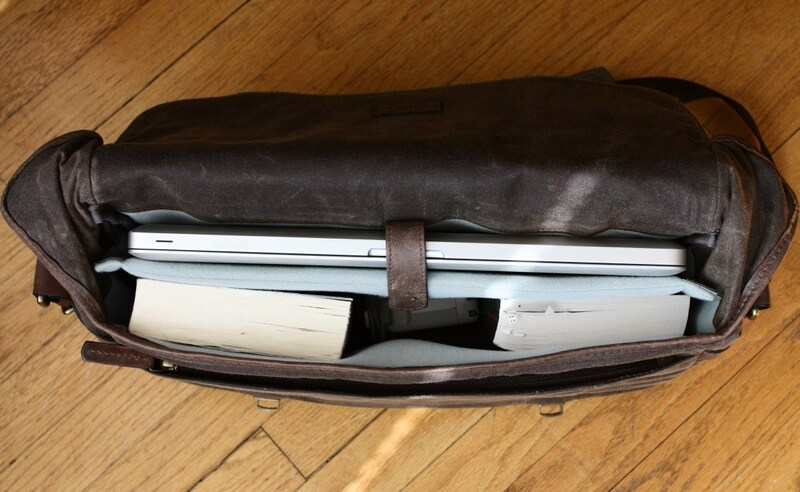 My MacBoook Pro fit in with lots of spare room, so if you’ve got a chunkier 15″ laptop (I don’t think 17″ would go) you’ll be fine; and after all you can adjust the space used for the laptop compartment. The most disappointing part of the bag has to be the shoulder strap. 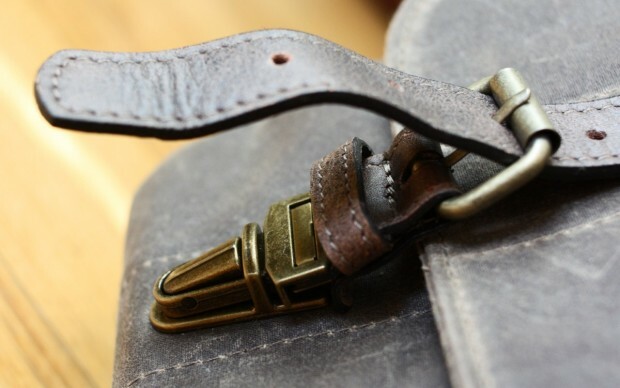 Although the strap itself is of nice thick nylon, it’s not very wide, and the leather “pad” that sits on your shoulder is microscopic and provides almost no padding at all. 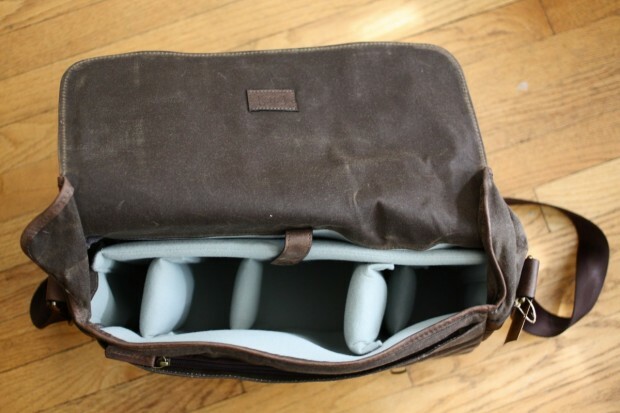 If you’re carrying a laptop, two lenses, a 7D with a lens attached, and a couple other miscellaneous things, that’s quite a bit of weight and you’re going to want something more cushy on your shoulder. The leather didn’t grip my shoulder well, either. The Booq Cobra messenger bag had a fabulous shoulder strap — something to think about, ONA. I also could have used a little more ready access on the outside, as a photographer. There are a couple very small pockets underneath the strap attachments, which will hold a small lens cap or a couple pens, but a little more room for quick stowage would have been appreciated. This bag should be on the short list for fashion-conscious photographers. It’s functional, sure, but so are a hundred other bags. This isn’t branded like a photo bag, so it won’t attract attention to you either as a tourist or thievery target, but it will serve perfectly well for a day bag while getting around. I’m concerned that the interior material might fuzz and ball up, but if you get a configuration you like and stick with it, it should be fine. At $279 it’s approaching luxury territory, but the fact is you can’t get Waxwear cheap. There aren’t many bags like this available at all, much less for under $300 (Manhattan Portage has one for cheap, but it isn’t as nice, and Jack Space has some nice ones, but for significantly more). If you’re an adventurous and tasteful photographer, you should definitely give the ONA Union Street a look.